International Students, Langley Flying School: Information for International Students applying to Langley Flying School. Do we have to wear a uniform? Thank you for visiting the Langley Flying School website. We appreciate your interest in our School, and we hope be able to welcome you one day as one of our International Students. Importantly, please note important changes that have occurred in our application process and requirements—we have attempted to reduce the financial burden faced by international student in their initial application, and we have also refined our $500 International Student Bursary that is awarded to international students upon completion of the initial Private Pilot Licence. These changes our discussed below in the Processing Application Fee section. One of the great pleasures we have as Flight Instructors is the opportunity to teach students from all over the world who come to Canada to learn to fly; some of them—perhaps yourself—land at our School, and it is with great pride that we get to send them back to their homes and families as fully qualified professional pilots. Canada's pilot licences and ratings—and especially the Canadian Commercial Licence—are top ranked throughout the world, owing to the reputation of the Canadian licence holders for solid pilot skills, thorough yet practical pilot knowledge, and safe and effective pilot decision-making. The history of international flight training in Canada goes back to the 1940s with the Commonwealth Air Training Plan, and it is pride and conviction that we—like many other private flying schools located throughout Canada—are able to continue with the tradition of providing effective and proven pilot training programs for international students. Langley Flying School is committed to the fair and equitable treatment of all of its International Student and does not maintain affiliation with any business/recruiting agents or special interest groups in other countries that could lead to unfair recruitment fees levied against students, and preferential access to flight training resources. All International Students are treated fairly and equally, and Langley Flying School seeks to minimize the cost of training in all cases. 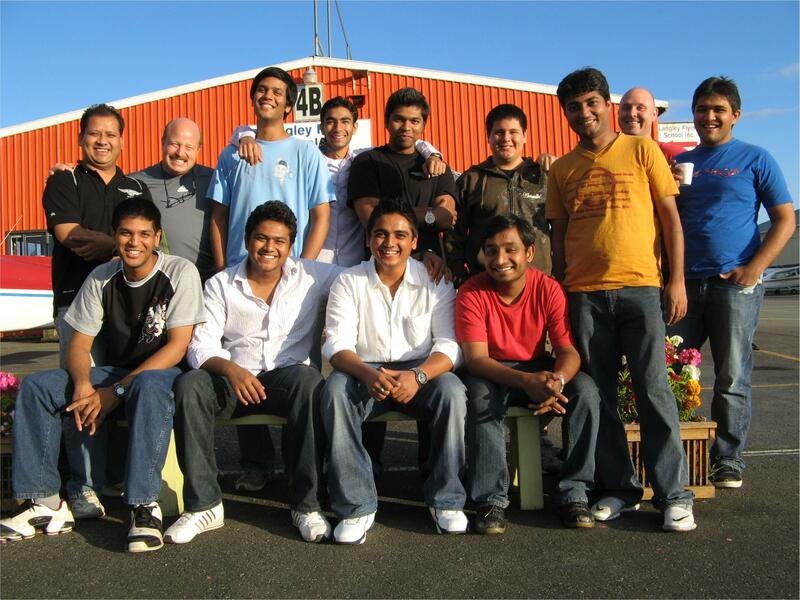 International Students are fully integrated with Langley Flying School's domestic students. In accordance with the International Civil Aviation Organization, all pilots must demonstrate speaking and listening comprehension in English. Transport Canada's Aviation-Language Proficiency Test, as well as description of the required standards, are described at the following link: ALPT. Because Tranport Canada requires that the ALPT be administered face-to-face in Canada with a designated examiner, International students must make special effort to ensure they meet the requirements of this examination before they commit time, energy, and money to pilot training. With respect to time-line, you should know that the Private Pilot Licence—pursued on a full-time basis—can be completed in as little as six weeks, but normally requires between three and six months, depending on student performance (time required before students' first solo flight commonly varies between 10 and 30 hours, depending on performance skills). Completion of the Commercial Pilot Licence typically requires an additional six to eight months. To complete these licences along these time-lines, International Students will have to fly daily. The same programs will take a year or more if the training pace is less than full-time. While completion of the Commercial Pilot Licence requires the longest time, the Multi-engine Class Rating and the Instrument Rating are the shortest—the Multi-engine Class Rating requires only about three weeks, and the Instrument Rating is just a little longer—about four to six weeks. Critical in your understanding of pilot training completion times is the fact that training is performance-based—students must successfully complete qualifying Transport Canada flight tests and written examinations, and student performanced—especially during Private Pilot Licence training and preparaton--varies tremendously. Students can pursue their ground studies as independent students (moving through the training one-on-one with a Flight Instructor), or they can join the full-time 8 to 10-Month Professional Pilot Program where, upon completion, student are qualified as Commercial Pilots with Multi-engine and Instrument Ratings. The 8 to 10-month course is based on flight training in the morning and groundschool in the afternoon, and students are going at it 5 days a week. It would be great if we could predict with accuracy just how long (and therefore how much money) the pilot licences and rating training will take, but unfortunately, student performance varies considerably, especially during the Private Pilot phase of training. Transport Canada regulations require that Flight Instructors cannot recommend students for flight tests or written examinations until they meet the standards established by Transport Canada—Flight Instructors must certify in writing to this affect when the recommendation and application for flight tests or written examinations are submitted to Transport Canada. We can say, however, that full-time students usually complete their Private Pilot Licence at or near the minimum hours required—they are at it daily, and they get good really fast. Please read the Private Pilot Licence course outline carefully regarding performance variations. In contrast, the Commercial Pilot Licence, Multi-engine Class Rating, and Instrument Rating are reasonably predictable with respect to completion costs—the proficiency of these students is at a higher level, merely because they or more experienced. All students are advised to keep "cash in reserve" just in case of need for additional pilot proficiency training, especially for students of the Private Pilot Program. Becoming a pilot is a process of reaching the standards of proficiency and knowledge required by Transport Canada and the ICAO, and is not a matter of simply "accumulating flight time." We remind you again to check the cost section of the individual Pilot Training Programs for additional information. Student pilots do not need the additional pressure of financial worries as they complete their training. For setting up a Canadian bank account, information is available from the Royal Bank of Canada. It goes without saying that all costs are quoted by us in Canadian Dollars, and you can visit the following link to calculate your currency's conversion: Bank of Canada. International student are automatically eligible for the $500 International Students Bursary upon successful completion of the Private Pilot Licence Program. All flight schools in British Columbia are required by law to charge the GST (5%). Visa, MasterCard, American Express, and Debit Cards are accepted. Your family name (exactly as it appears on your passport). Your first name and middle name(s) (exactly as it appears on your passport). Your full mailing address (including postal code). The programs you wish to take (e.g., PPL, CPL, IFR, MER). For International students, our admissions process requires that you send a non-refundable $500 for Letter of Acceptance and $500 for administrative fee, payable to Langley Flying School, which will be used to fund administrative and courier costs, including the preparation and issue of the Letter of Acceptance. All payments made by International students must be made by Wire Transfer—please contact the Chief Administrator via email to obtain detailed information on how to pay with Wired Transfer. Once this administrative fee has been paid, and all information regarding the applicant student is receive, we will courier to you the Letter of Acceptance, and this, in turn, will be presented by the applicant student to the Canadian Consulate or Embassy in support of an application for the student visa. The volume of international e-mail inquiries is considerably high at the present; we will try replying to each inqury as soon as possible. To expedite the application process, review the information carefully on this website and follow the suggestions contained on this page. Students who are able to make an independent decision to begin training at Langley Flying School will be processed with little delay. For more information, see Langley Flying School Students Working Off-campus. Canada has a government health plan and all medical services are provided to Canadians by the government. Students coming to Canada to study must therefore have private insurance, which must be in place prior to arriving in Canada. We suggest Langley Flying School students purchase medical insurance from Ms. Katherine—she can provide private medical insurance to international students, which will protect you against the cost of both emergency and non-emergercy medical expenses. Mailing address for mailing out the policy documents. General information regarding the medical insurance requirements can be obtained the following government website: www.healthservices.gov.bc.ca/msp/. If you are an international student under 19, when you apply for a Canadian Study Permit, you might be asked to provide documents showing that you have a custodian in Langley who can help you in case of need. We will assist in making custodianship arrangements for students under 19 who are also staying in a homestay arranged by us. Students under 19 who wish to make their own arrangements for accommodation must also make their own custodianship arrangements. Please note that students under 19 must provide copies of custodianship documents when they first register. The applicant required a deposit to confirm homestay and custodianship. The payment can be made online. We will prepare the Custodianship Form once the deposit has paid. When the applicant gets the Canadian Study Permit, the deposit will transfer to the Custodian Fee (Non-Refundable). After you have reviewed the information on this website concerning the training program and facilities, please to begin an email exchange with me regarding any questions you may have—if I can't personally respond, I will pass your message on to one of our Flight Instructors. We also provide airport pick-up and transfer services. Follow the link for additional information.